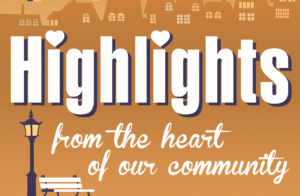 The show airing April 16, 2018 – April 23, 2018 ‘highlights’ the WV Breast Health Initiative and Roark-Sullivan Lifeway Center. We interviewed Kassie Lawless, Mrs. WV America and Board Member with WVBHI along with Zena Harris, Team Captain for Race for the Ribbon. They discussed the ‘new’ WV Breast Health Initiative. Kassie talked about WVBHI having a new name but same mission of supporting individuals from WV diagnosed with breast cancer. Susan G. Komen Foundation WV has dissolved but the WVBHI continues their support. The West Virginia Breast Health Initiative (WVBHI), is a new organization with an ongoing mission – to increase breast cancer awareness and prevention across West Virginia. WVBHI builds on previous efforts in West Virginia to raise awareness and educate West Virginians about breast cancer. Emphasis will be on increasing breast health education, financially assisting breast cancer screenings, facilitating patient navigation, and promoting survivor recognition. One hundred percent of funds raised through the WVBHI will remain in West Virginia and will continue grants with existing health partner programs. 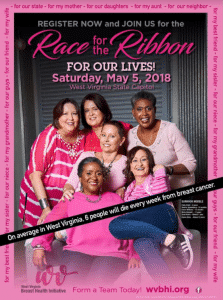 The Annual Race for the Ribbon is scheduled for Saturday, May 5th beginning at 8:00 a.m. at the WV State Capitol Complex. Simply click here to learn more and register. Or call 304-556-4808 for more information. Zena talked about her story. Diagnosed a year ago, she received early treatment and surgery and is now cancer-free. She encouraged all ladies to get regular mammograms. She also invited everyone to join her Race for the Ribbon team, Zena’s Warriors. We also interviewed John Thompson, Executive Director, Roark-Sullivan Lifeway Center. He talked about the mission and purpose of RSLWC. Prevention: Working to prevent homelessness in the Kanawha Valley. 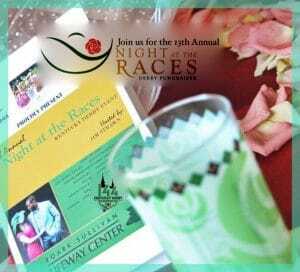 To help operate their programs, they are hosting their 13th Annual Night at the Races on May 5th beginning at 5:30 at Edgewood Country Club. This Kentucky Derby Watching Party is full of delicious food, spirited drinks, table games (with fun money), hat & tie contests, auction items, and of course watching the 144th running of the Derby. Click here to Purchase Tickets. Or make a donation. Contact John at 304-414-0109 to learn more.